I’ve absolutely fallen in love with Overwatch. I’ve loved playing, I’ve loved watching other people play it, and most importantly I’ve loved watching the competitive matches. A few friends and I have started a team and we’re planning on competing locally in some of the competitions that have recently popped up. We’re not taking it too seriously, but I’ve taken to learning a couple of small strategies that allow us to make sure we keep winning until we meet the level 90 plus players who teach us a lesson or two. Overwatch’s hidden elo or matchmaking system still confuses me, but for now I’m going to offer a short guide map-by-map guide on how to win easily, starting with Numbani on defense. And yes, there’s some bastion and Torbjorn. Overwatch has a vast hero pool, and each hero has their respective role in your victory or defeat. We’re going to abide by international rules for this post and disallow more than one of the same hero per team. That means you can’t have five tanks and a support. Numbani has a ton of choke points which you can use to your advantage on defense or attack. Often teams make the mistake of playing overly aggressive on the first point, pushing all the way towards the busses and allowing their opponents to fly by them, or get picked off one by one. The strategy of holding the blue bus can work, and it has worked for us in the past, but I wouldn’t recommend this is you’re not confident that you can stop your opponents and push them back before falling off to the point. I would strongly recommend setting up on the actual point, making use of the higher ground, and playing it to your advantage. The same applies to both attack and defense, so let’s dig deeper and look at specific spots which are crucial to your victory on either side. I’ll start with favourable hero compositions for the first point, and continue with worst case scenarios. Possible variations if you have players who are really good at certain heroes: Pharah, Hanzo, and Mei. The compositions are interchangeable. 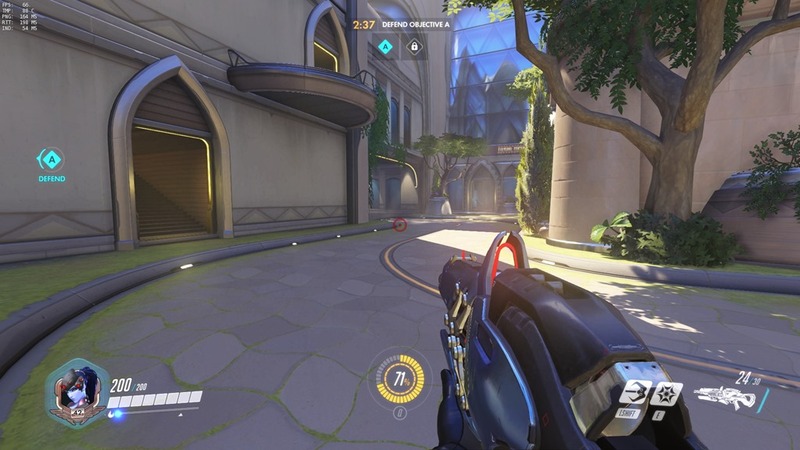 For example, Symmetra is great to for dealing with choke points when putting up her Sentry Turrets, and of course her Teleporter to cut the distance in half when you die. Mercy is almost a must have on any map. Her Caduceus Staff heal and damage buff are great on your damage dealers, and her resurrect ultimate cooldown is relatively short if you stays alive and remains active. Widowmaker is an almost must have on any map. A decent Widowmaker means enemies will be taken out effectively, she’s extremely elusive with her Grappling hook and provides much-needed information with her Infra-Sight which has a relatively short cool down. She has a great combination with Soldier: 76 which will become clear when I discuss the positions to hold. Adding a Torbjorn/Bastion is great if you want to substitute one of them out for Symmetra. Your offensive heroes will hold specific spots, and this is where McCree becomes extremely powerful. Keeping the higher ground (trusting his Widowmaker and Solider: 76 to cover him) McCree can become extremely difficult to deal with, and his Deadeye ultimate makes for a great hold on the higher ground. I mentioned Roadhog as a tank since he’s strong on the first point for pulling enemies out of position and as well as keeping them off the point with his ultimate. Reinhardt is a must have if you lose the first point, but also a strong first line of defense of any pushing enemies. What happens if you lose point A? Well, then it becomes a bit more interesting. You need to move back to the second choke hold with higher ground advantage. Your hero composition remains somewhat similar, but I would recommend getting either a Reaper/Tracer/Genji who can annoy the enemy team from the backlines. Here Reinhardt is crucial. He will need to face-tank the payload with the Mercy and McCree allowing his teammates to sit close enough that they can deal with any annoyance disrupting their tank. Your aim here is to defend the second check point, cutting off any choke points your enemy team may use. If they manage to push you all the way into the second checkpoint, you can hold them off effectively once again making use of the higher ground, and staying clear of any possible back stabbing points. Below are the certain choke points which are crucial to hold. Being a lonely person, I was the only person in the lobby, but I will try and explain as best as possible. 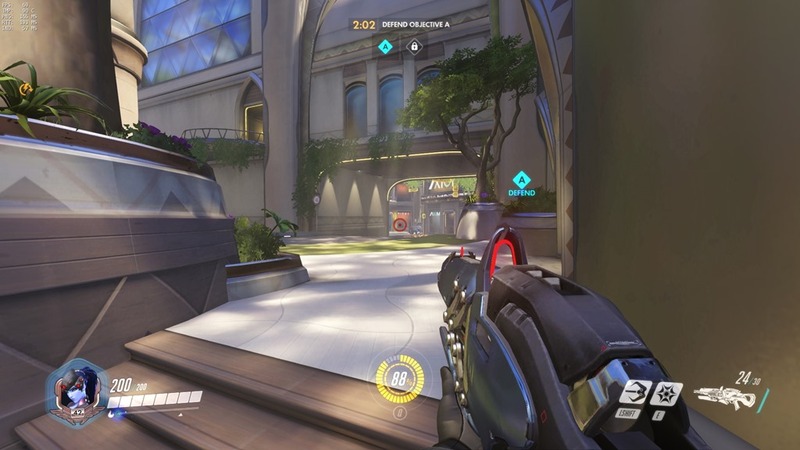 Widowmaker remains pretty much where she is in the image above, but make sure you remain mobile, not standing in the same spot which will make you easy to pick off. Solider: 76 and Bastion/Torbjorn will be on your left, Soldier will add additional fire power while making sure the team remains healed up. Symmetra (if you choose her) will be at the bottom setting up Sentry turrets in choke holds and setting up a teleporter for quick return. Your tank will be almost on the Payload, trying to stay out of site as much as possible and getting in the way when necessary. I wouldn’t recommend trying to push them back AS they take the payload. If your offensive heroes are able to trade a few kills early on, allow them to, but set up around the above area to insure you make a decent hold. Again Widowmaker will make use of the higher ground with the platform, and the one to her right. Your job is to pick off the players who are not protected by Reinhart’s shield. Solider:76 will be by your side to ensure you’re not taken out by an enemy sniper or Winston. You need to be careful, and make use of your Venom mine for information and slowing down enemies. Soldier needs to warn the team of any movements above, or to the close right which is an easy point of entry for enemy offensive heroes. McCree, Mercy and Reinhardt will face-tank the payload, making sure it’s movement is hindered allowing the damage dealers to pick off any unsuspected enemies. This is where I’d recommend picking up a Tracer/Genji/Reaper to disrupt the enemy from behind. Being an annoyance is key to setting up pick off for your Widowmaker, McCree and Soldier:76. This is where it becomes a bit more tricky. If you lose the second objective, you’re now essentially fighting in one of the toughest spots. There are plenty points of entry, so I recommend setting up in two split positions. I’d also recommend picking up a second hero, Lucio is probably the best for this scenario. You can do without Lucio if you have a Solider:76 holding the position in the second image alongside a McCree. You can also pick up a Bastion as a last line of defense. There are positions he can hold which make it difficult for the enemy to kill him, but I genuinely stay away from Bastion in the last part as he requires too much attention to protect and keep alive. Torbjorn is also really strong as there are some sneaky areas to set up your Turret, but do with this guide what you please. Widowmaker will once again hold the choke spots, picking off heroes who try to play too aggressive and stray away from Reinharts shield. Watch out for Winston diving on you, make sure an escape route or a healer are nearby. Soldier:76 can play somewhat mobile, but if he’s holding the point in the second image, he needs to ensure he’s backed up as to not be taken out by the enemy sniper or offensive heroes. Reaper becomes extremely crucial here as enemies tend to group up more and panic as they get closer. Your Death Blossom becomes extremely effective at this point as well as getting behind them and taking down the healers. Reinhardt, Mercy and McCree will continue to face-tank the payload and hold them off. The choice of a second healer is up to you. Having a Lucio skating around is always good. Make sure to target the enemy healer, and always protect your own. Keep your ultimates for the most optimal times, and don’t just try get the Play of The Game. Synergy is important, and with the above mentioned compositions you can combo some great ultimates to bring down your enemies. Use the map to your advantage and become well versed in your movements, and move with purpose. Trying to get Gold Eliminations may look good on the score screen, but if you’re endlessly getting kills which won’t benefit the team and dying, you’re not necessarily contributing to the end goal.